Five hundred years ago today, October 31, 1517, Martin Luther nailed his letter of protest against the perceived abuses of the Church on the door of his hometown parish church. It was pivotal day in the history of western civilization. 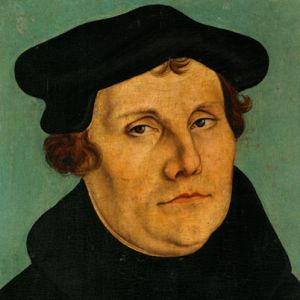 If I were still a Lutheran, I would be celebrating this day as the day that Martin Luther put the Christian Church back on the correct path. But I am no longer a Lutheran. I am no longer a Christian. So should this day matter to me as a non-religious person? Yes. Very much so. It is a day to celebrate the beginning of the end of the unquestioned authority of churchmen. After Luther, no clergyman could simply tell his flock, “Believe what I tell you”. The clergy were forced to explain why the laity should listen to them. Both Protestants and Roman Catholics formulated doctrinal statements or Confessions. And people argued and debated these beliefs, leading to new Protestant denominations which questioned Luther’s authority. And all this arguing and debating caused people to think. And once they started thinking about what they believed, instead of just believing they were told to, they began to ask themselves, “Does this make sense?” And some of those people answered that question and said, “No. None of it makes sense! I no longer believe.” They left the Church and became free-thinkers, deists, agnostics, and even atheists. So thank you, Martin Luther! We all owe you a great debt of gratitude. Previous postWhat Would It Take for Me to Believe in Jesus Again? Next postHow Odd. The Miracles of Elijah and Jesus are Amazingly Similar to the Miracles of Moses. Coincidence? This remark: The clergy were forced to explain why the laity should listen to them. is almost ironic when one considers the religions of today.